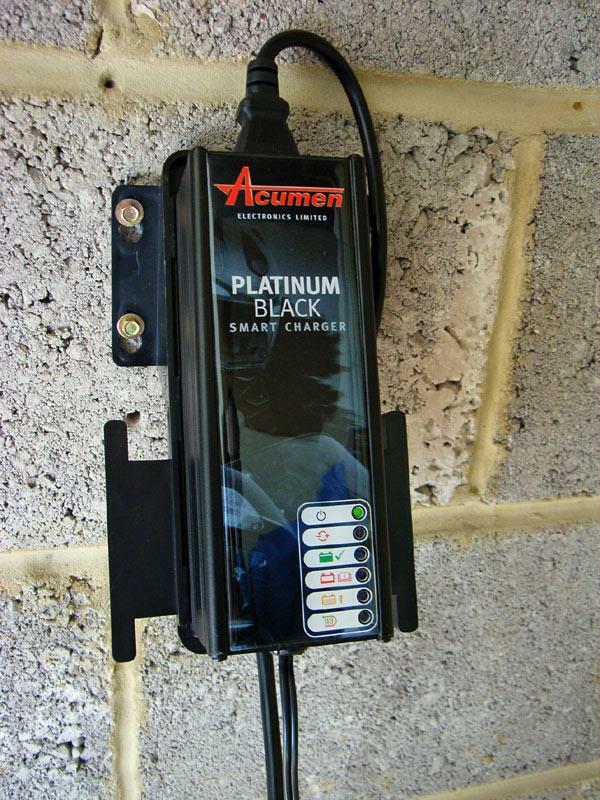 New for 2010, Acumen’s second generation smart charger retains its robust splash-proof aluminium case (certified sealed to IP54) but gets a sophisticated black colourscheme so that it’s instantly recognisable. Inside its microprocessor controlled charging and maintenance software has been remodelled to deliver what Acumen claim to be the most sophisticated floating charge on the market. That means that the Platinum will drop to zero current when the battery is fully charged, and will top it up as it required, ensuring that the battery only gets the charge it needs and avoiding the danger of over-charging, which can shorten its lifespan. Six coloured LEDs on the front of the unit indicate power, polarity, battery condition, recovery mode, etc. These have been increased in size to 5mm diameter, making them easier to see. Protection is built in against reverse polarity, over voltage and over heating. It costs £49.99 and includes a waterproof lead for permanent connection to the motorcycle battery, 3M extension lead, crocodile clips and a wall bracket. This is a smart charger and maintainer for use on 12v lead-acid bike and car batteries up to 100Ah.